When you walk into a sewing shop and see all the Different Types of Sewing Pins, how do you know which ones are the best choice for Beginners? 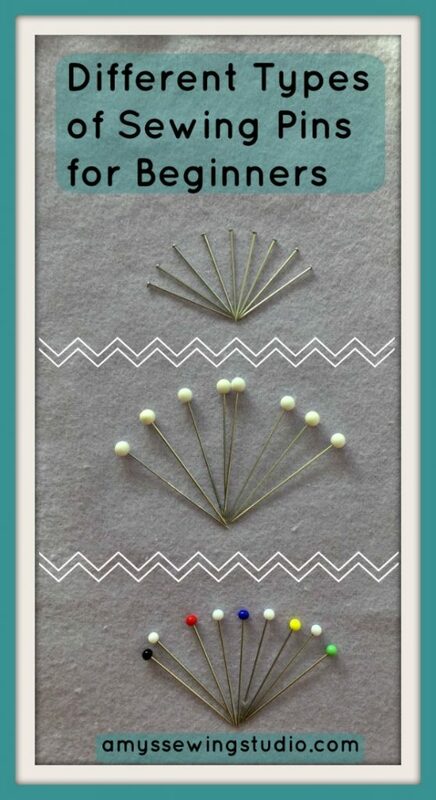 I like to keep information simple and will show you the 3 common types of pins that work for beginner sewing projects. These pins are very plain and have a little flat head. 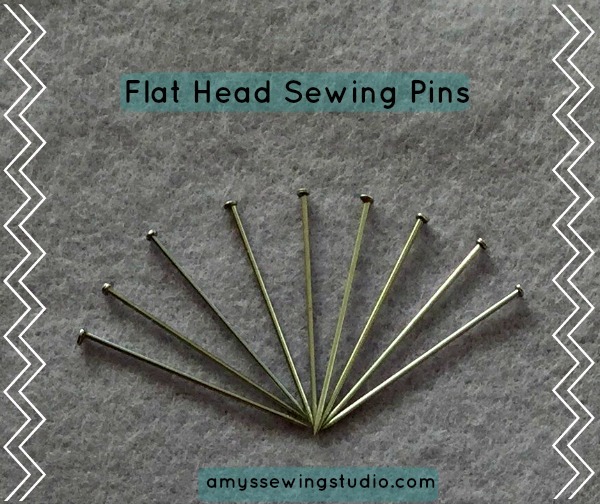 Many Beginner Sewing Kits are supplied with these pins. These pins work great when you will be using a hot iron and have to press over the pins. . I have seen them come in 1 1/6″ or 1 1/4″ sizes. If you are just buying pins for the FIRST time- I’d suggest these! Why? 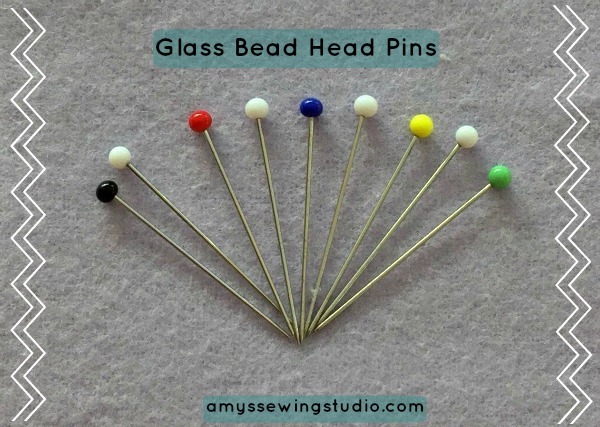 If you ever find yourself having to press a project that still has pins, these glass head pins WON’T MELT from the iron’s heat-BONUS! These pins come in a variety of sizes and lengths. What you choose will depend on the project you are working on. Any of these Pins mentioned above have standard pointed tips and work great with cotton fabrics. I mention cotton fabrics because cotton fabrics are the easiest fabrics to learn to sew on because of stability. Using a Knit or other Stretchy Fabric? 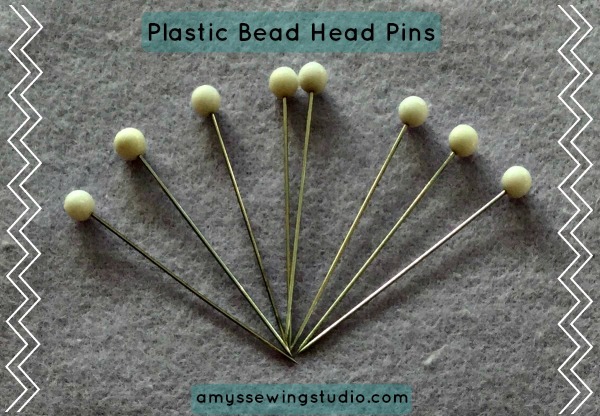 If you are just learning to sew but insist on learning with other types of fabrics that may be stretchier (like knits or lingerie fabric), Ball Point pins work great as they have a more rounded tip to prevent snagging. The packaging will tell you if the pins are Ball Point Pins. What is the difference between a Standard point pin and a Ball Point Pin? A Standard Point pin has a sharp pointed tip to glide thru the fabrics. A Ball Point pin had a rounded tip for the purpose of NOT catching threads on stretch fabrics. Watch this “How it’s made” video for making Needles and Pins! If you want to skip thru to see how Pins are made, fast forward to the time in the video of 3:51. Pins are at the very end of the video. Enjoy! Be sure to check out what other Sewing Tools you’ll want for getting your sewing adventures off to a great start!